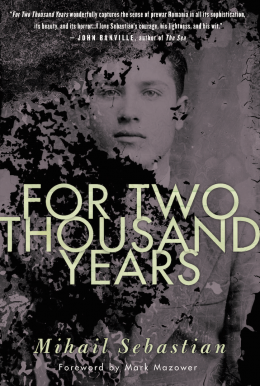 So says the anonymous narrator of the powerful novel For Two Thousand Years as he reflects on his time as a university student in 1920s Romania. But this book belies those words. Even as he and fellow Jewish students are assaulted daily, he seeks to understand himself, his attackers, and his own response to their anti-Semitism. The strength of this book is found in its clear-eyed reporting of conversations the narrator has with friends and colleagues – their candid brutality at times stunning – combined with his thoughtful reflection on what he hears and sees. The Nazis haven’t arrived in Romania yet, but anti-Semitism is on the march. Jewish students are attacked and beaten for having the temerity to attend their classes. Professors at best stand quietly by; at times they encourage the perpetrators. Each night the narrator returns to a dormitory where the victims compare wounds and try to imagine the future. The novel follows this insightful young student into adulthood. The narrator changes his major to architecture, at the encouragement of a nationalist professor he idolizes. He becomes an architect and is hired by an eccentric American tycoon named Ralph Rice. He lives in Paris for a time, and eventually returns to Romania to work on Rice’s oil fields. The drilling kills the local plum trees, which are the heart of the peasant economy and culture. An entire village is moved to make way for oil production. Then the narrator takes on the design and building of a house for the professor he once loved, whose classes he used to be thrown out of by the professor’s young acolytes. Bronwyn Mauldin writes fiction and poetry, and creates zines. She will be an Artist in Residence at Denali National Park and Preserve in summer 2018. More at bronwynmauldin.com. Click on the logo to purchase shirts, mugs, stickers, and buttons with the TNBBC logo! I have been buried beneath small press and self-published review copies since 2009. My passion for supporting the small press and self publishing communities has driven me out into the world wide web to demonstrate alternative ways to spread the word about amazing publishers, authors, and novels you might never had heard of. Feeding your reading addiction, one book at a time. Share book reviews and ratings with The Next Best Book Club, and even join a book club on Goodreads.